When your heating system is on the fritz, there’s no time to waste. Halo Heating & Cooling will provide Nashville, TN heating repair right away to get your system working like it should once again. In other words, we’ll get you back to having a warm, comfortable home, or as we like to call it, a Heavenly home. Call us at (615) 383-4822 as soon as you require heating repair and our company will get your home warm again in no time. Our residential heating repair will return your heating system to its prime condition once again. If it’s not running quite right or it’s completely broken down, our technicians will have it heating your home again. Our knowledgeable technicians use their expertise and quality parts during each repair to provide you with a high standard of service. Even when you regularly maintain your heating furnace or pump, you’ll need a repair at some point, simply due to ongoing use. Taking care of repairs quickly can prevent them from turning into worse problems. At Halo Heating & Cooling, we even have our technicians check for needed repairs during routine maintenance; that allows them to take care of any problems before the cold season even starts — preventing a breakdown during a freezing cold day. 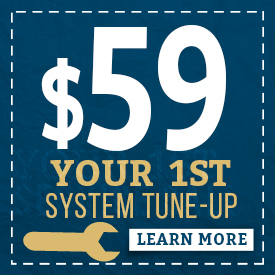 If your system isn’t completely broken down, you can still usually tell when it needs repairs. The system might not seem like it’s running as powerfully as it was or your energy bills might suddenly go up. You might also notice that certain parts of your home don’t seem like they’re getting warm. If you discover any of these signs in your home, give us a call and we’ll send our technicians to see if you’re in need of repairs. In addition to our heating repairs, our HVAC Nashville, TN services include heating installation and maintenance, services for cooling systems and services to clean the air in your home. Browse our website or contact us to find out more. So you’re ready for repairs in advance, we recommend you sign up for our Halo Comfort Club protection. This plan is there for you when you need help most. It includes a 21-point system inspection to check your system’s health and find any problem spots. It also includes HVAC repair in Nashville, TN, with a 10% discount on the repairs. With this plan, you’ll be ready for any hiccups your heating system throws at you throughout the winter. Ask us for more information about the Halo Comfort Club or learn more here. Choosing Halo Heating & Cooling brings you trained heating experts that go through background checks before working in your home. Each heating repair technician will arrive in professional attire and will provide a high level of service. With all of the work we perform, we provide a two-year workmanship warranty and we guarantee that you will be 100 percent satisfied. In addition, you’ll get the best of both worlds with us: top-notch labor and parts at low prices. Need Your Heating System Repaired Now? Don’t wait around in the cold — contact us as soon as your heating system needs repairs. At Halo Heating & Cooling, we offer a high-quality heating service to Nashville, TN residents. As soon as your home isn’t feeling as warm as it should, give us a call at (615) 383-4822.